My brother and I both went to universities with proud football traditions. He went to University of Southern California, and I went to University of Georgia. His team has snared some recent national championships, yes, but he does not have a collegiate garden gnome like I now do. For a while now my brother has collected interesting little USC knick knacks to proudly tout his alma mater. Perhaps someday archeologists will find remnants of the Trojan baby mobile and barbeque tool set, and they will study how such artifacts were used. Okay, so maybe I bought the mobile and grill tools for him. I never denied enabling this behavior. But I have now trumped all displays of college football fandom by obtaining the most elusive and coveted of all items. If by elusive and coveted you mean available on Amazon and ranked #71 in its Collectible Figurines category. 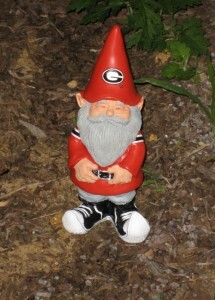 The University of Georgia Collegiate Garden Gnome. Adam bought this for me because as soon as he saw it he knew I had to have it. That’s a deep understanding of my psyche. To be able to distinguish between my snobbery towards things like fanny packs and Crocs and my infatuation with things like leopard print Mickey Mouse ears is a subtle art. But the student has become the master with this one. I had no idea how much I wanted this gnome until he gave it to me. My flowerbed now looks complete! Except when we go on vacation because then obviously the gnome will go, too. Top that!